Posted Sep 10, 2017 by Eds. Google denied any role in Lynn’s firing, and Slaughter tweeted that the “facts are largely right, but quotes are taken way out of context and interpretation is wrong.” Despite the conflicting story lines, the underlying premise felt familiar to me: Six years ago, I was pressured to unpublish a critical piece about Google’s monopolistic practices after the company got upset about it. In my case, the post stayed unpublished. I was working for Forbes at the time, and was new to my job. In addition to writing and reporting, I helped run social media there, so I got pulled into a meeting with Google salespeople about Google’s then-new social network, Plus. The Google salespeople were encouraging Forbes to add Plus’s “+1″ social buttons to articles on the site, alongside the Facebook Like button and the Reddit share button. They said it was important to do because the Plus recommendations would be a factor in search results—a crucial source of traffic to publishers. This sounded like a news story to me. Google’s dominance in search and news give it tremendous power over publishers. By tying search results to the use of Plus, Google was using that muscle to force people to promote its social network. I asked the Google people if I understood correctly: If a publisher didn’t put a +1 button on the page, its search results would suffer? The answer was yes. After the meeting, I approached Google’s public relations team as a reporter, told them I’d been in the meeting, and asked if I understood correctly. The press office confirmed it, though they preferred to say the Plus button “influences the ranking.” They didn’t deny what their sales people told me: If you don’t feature the +1 button, your stories will be harder to find with Google. With that, I published a story headlined, “Stick Google Plus Buttons On Your Pages, Or Your Search Traffic Suffers,” that included bits of conversation from the meeting. The Google guys explained how the new recommendation system will be a factor in search. “Universally, or just among Google Plus friends?” I asked. ‘Universal’ was the answer. “So if Forbes doesn’t put +1 buttons on its pages, it will suffer in search rankings?” I asked. Google guy says he wouldn’t phrase it that way, but basically yes. Google promptly flipped out. This was in 2011, around the same time that a congressional antitrust committee was looking into whether the company was abusing its powers. It escalated quickly from there. I was told by my higher-ups at Forbes that Google representatives called them saying that the article was problematic and had to come down. The implication was that it might have consequences for Forbes, a troubling possibility given how much traffic came through Google searches and Google News. I thought it was an important story, but I didn’t want to cause problems for my employer. And if the other participants in the meeting had in fact been covered by an NDA, I could understand why Google would object to the story. Given that I’d gone to the Google PR team before publishing, and it was already out in the world, I felt it made more sense to keep the story up. Ultimately, though, after continued pressure from my bosses, I took the piece down—a decision I will always regret. Forbes declined comment about this. But the most disturbing part of the experience was what came next: Somehow, very quickly, search results stopped showing the original story at all. As I recall it—and although it has been six years, this episode was seared into my memory—a cached version remained shortly after the post was unpublished, but it was soon scrubbed from Google search results. That was unusual; websites captured by Google’s crawler did not tend to vanish that quickly. And unpublished stories still tend to show up in search results as a headline. Scraped versions could still be found, but the traces of my original story vanished. It’s possible that Forbes, and not Google, was responsible for scrubbing the cache, but I frankly doubt that anyone at Forbes had the technical know-how to do it, as other articles deleted from the site tend to remain available through Google. Deliberately manipulating search results to eliminate references to a story that Google doesn’t like would be an extraordinary, almost dystopian abuse of the company’s power over information on the internet. I don’t have any hard evidence to prove that that’s what Google did in this instance, but it’s part of why this episode has haunted me for years: The story Google didn’t want people to read swiftly became impossible to find through Google. Google wouldn’t address whether it deliberately deep-sixed search results related to the story. Asked to comment, a Google spokesperson sent a statement saying that Forbes removed the story because it was “not reported responsibly,” an apparent reference to the claim that the meeting was covered by a non-disclosure agreement. Again, I identified myself as a journalist and signed no such agreement before attending. People who paid close attention to the search industry noticed the piece’s disappearance and wrote about it, wondering why it disappeared. Those pieces, at least, are still findable today. As for how effective the strategy was, Google’s dominance in other industries didn’t really pan out for Plus. Six years later, the social network is a ghost town and Google has basically given up on it. But back when Google still thought it could compete with Facebook on social, it was willing to play hardball to promote the network. Google started out as a company dedicated to ensuring the best access to information possible, but as it’s grown into one of the largest and most profitable companies in the world, its priorities have changed. Even as it fights against ordinary people who want their personal histories removed from the web, the company has an incentive to suppress information about itself. Google said it never urged New America to fire Lynn and his team. 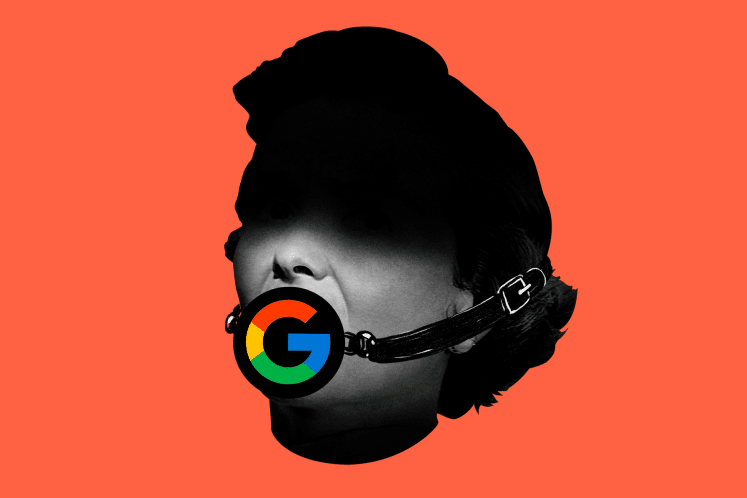 But an entity as powerful as Google doesn’t have to issue ultimatums. It can just nudge organizations and get them to act as it wants, given the influence it wields. It’s safe to say they won’t be receiving funding from Google. This morning, Google’s vice president of global communications, Rob Shilkin, emailed me to say definitively what two of his colleagues wouldn’t: “We had nothing to do with removing the article from the cache.” When I asked Shilkin how he came to that conclusion, he said it was based on old internal Google email threads. Since his colleagues had old email threads about the issue but never denied that Google took down the cache, I asked Shilkin if I could see the threads myself. He declined. His entire email, which he agreed to publish, is below. I wanted to clear the air on this. We have always enjoyed working respectfully with you and are sad to hear that you’ve carried this since 2011. I’m sorry about how this went down, and wanted to give you the tick-tock from our end. From our perspective, this was a disagreement over whether a meeting was held under NDA. As you know, you attended a Forbes business meeting with the Google sales team, which was presenting on the (then) new +1 button. It didn’t strike our sales team as unusual that someone from Forbes’ editorial was in the meeting because they’d often attend these types of meetings – Editorial is often involved in a publication’s social strategy. However, like most of our client meetings that discuss new features, it was held under an NDA (it sounds like Forbes didn’t inform you of this before you attended and had we known you were going to report on the meeting, we would have raised that concern). Our sales team called their fellow attendees of the meeting from Forbes to express surprise that the article was based on a meeting held under NDA. I understand that one of our PR reps raised this concern to you, and then your editor. I understand that our PR rep asked that the piece come down from Forbes’ website, as it was reporting on a confidential business meeting. Your editor agreed – he told our PR rep that the article was being removed because it involved reporting on an NDA meeting. As for the Google cache, it’s trivial for a website owner to request its cache to be cleared (see here). I assume this is what happened because we had nothing to do with removing the article from the cache. I hope our team has enough credibility, among those who work with us, that you know that we couldn’t and wouldn’t engage in this type of behavior – never have, never will. You have long held our and the tech industry’s feet to the fire on privacy issues. And you have written (more than) a few critical stories about Google+ and many other things Google-related 🙂 To my knowledge, never have we had any issues like this, with even the most critical story. On this one piece, there seems to have been an unfortunate misunderstanding over whether all the attendees at a meeting believed they were under an NDA. I won’t pretend to love how you shared your concern about this incident but – after a stiff drink – I’m glad you raised it. I hope that in the intervening six years, we’ve re-earned your trust. And if not, we’ll keep trying. Kashmir Hill is a senior reporter for the Special Projects Desk, which produces investigative work across all of Gizmodo Media Group’s web sites. She writes about privacy and technology.